Anthropologists working in Yuanmou, in Yunnan Province, have uncovered the remains of China's earliest discovered hominid, "Yuanmou Man," who lived in this area approximately 1.7 million years ago. "Peking Main," who lived in Zhoukoudian, to the southwest of modern Beijing 400,000 - 500,000 years ago, had the basic characteristic of Homo Sapiens. Peking Man walked upright, made and used simple tools, and knew how to make fire. Man in China passed from primitive society to slave society in the 21st century B.C., with the the founding of China's first dynasty, that of the Xia. 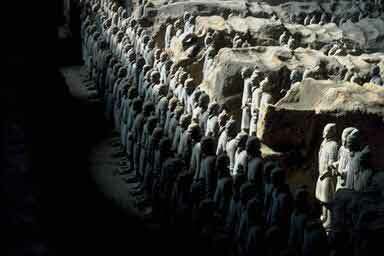 The subsequent dynasties, the Shang, and the Western Zhou saw further development of slave society. This era was followed by the Spring and Autumn and Warring States periods, marking the transition from slave society to feudal society. China was one of the countries where economic activity first developed. As early as 5,000 to 6,000 years ago, people in the Yellow River valley had already started farming and raising livestock. During the Shang Dynasty (more than 3,000 years ago), people learned how to smelt bronze and use iron tools. White pottery and glazed pottery were produced. Silk production was well developed, and the world's first figured inlaid silk weaving technique was being used. During the Spring and Autumn Period (770-476 B.C. ), steel production technologies appeared. During the Warring States Period (475-221 B.C. ), Li Bing and his son directed the construction of the Dujiang Dam near present-day Chengdu in Sichuan Province. This brilliant achievement in water conservancy made possible rationalized irrigation supply, flood diversion and sand discharge, and is still playing tremendous role in this regard even today. During the Spring and Autumn and Warring States Periods, philosophy and other branches of scholarship were unprecendentedly thriving, with the representatives of various schools vying with each other in writing books to discuss politics and analyze society. Hence the appearance of a situation in which "a hundred schools of thought contended." Famous philophers in this period include Lao Zi, COnfucious, Mo Zi and Sun Zi. In 221 B.C., Ying Zheng, a man of great talent and bold vision, ended the rivalry among the independent principalities in the Warring States Period and established the first centralized, unified, multi-ethnic state in Chinese history under the Qin Dynasty, and called himself Shi Huang Di (First Emperor), historically know as Qin Shi Huang, or First Emperor of the Qin Dynasty. During his reign, Qin Shi Huang standardized the script, currencies, and weight and measures, established the system of prefectures and counties, and constructed the world-renowned Great Wall as well as a large palace, mausoleum and temporary regal lodges respectively in Xianyang, Lishan and other places. The structures of these places above the ground have long been destroyed, but the objects underground are still there. The life size terracotta horses and armored warriors excavated from sites near the mausoleum of Qin Shi Huang are known as the eight wonder of the world, attracting swarms of Chinese and foreign visitors every day. At the end of the Qin Dynasty, Liu Bang, a peasant leader, overthrew the Qin regime in cooperation with Xiang Yu, an aristocratic general. A few years later, Liu Bang defeated Xiang Yu and established the strong Han Dynasty in 206 B.C. In the Han Dynasty (206 B.C. - A.D. 220), agriculture, handicrafts and commerce were well developed. During the reign of Emperor Wudi (Liu Che), the Han regime reached the period of its greatest prosperity: The emperor conquered the Ziongnu nomads and sent Zhang Qian as envoy to the Western Regions (Central Asia), and in the process pioneered the route known as the "Silk Road" from the Han capital Chang'an (today's Xi'an, Shaanzi Province), through Xinjiang and onward, finally reaching the east coast of the Mediterranean Sea. Along the Silk Road, beautiful silk products made in China were transported to he West in a steady stream. In 33 B.C., Wang Zhaojun, a palace maiden, was married to Huhanzie, chieftan of the Xiongnu, leaving a moving story about marriage ties between the Han and the Xiongnu. The multi-ethnic country became more consolidated. The Han regime existed for a total of 426 years. It was followed by the Three Kingdoms Period (220-265) of Wei, Shu and Wu. The most famous statesmen during the Three Kingdoms Period were Cao Cao (155-220). Zhuge Liang (181-234) and Sun Quan (182-252). Cao Cao was the founder of the State of Wei. He collected people of talent from all over the country, stationed troops in border areas to open up wasteland, established military farms, and finally gained control over the Yellow River valley. Zhuge Liang was the prime minister of the State of Shu, and a symbol of wisdom in ancient China. For many centuries, his lofty spirit of "bending himself to the task and exerting himself to the utmost till his dying days" has encouraged the Chinese people. Sun Quan was the founder of the State of Wu. He once allied with Liu Bei (161-223) to defeat Cao Cao at the Red Cliff, and later inflicted a crushing defeat on Liu Bei at Yiling. In addition, Sun Quan appointed officials in charge of agriculture, and had garrison troops or peasants open up wasteland and grow grain, thus promoting land reclamation to the south of the Yangtze River. Stories about them can be found in a novel called Three Kingdoms. The Three Kingdoms Period was followed by the Jin (265-420), the Southern and Northern Dynasties (420-589), and the Sui Dynasty (581-618). In 618, Li Yuan founded the Tang Dynasty (618-907). later Li Shimin, son of Li Yuan, ascended the throne as Emperor Taizong, who was one of the greatest emperors in Chinese history. Emperor Taizong adopted a series of policies known as the Zhenguan reign period reforms, which pushed the feudal society to the height of prosperity. Agriculture, handicrafts and commerce flourished; technologies for textile manufacture and dyeing, porcelain production, smelting, metal casting and shipbuilding made great progress. During this time, land and water transportation was also fairly well developed and economic and cultural relations with Japan, Korea, India, Persia, Arabia and other countries were extensive. After the Tang Dynasty, there came the Five Dynasties and Ten Kingdoms (907-960). In 960, Genreal Zhao Kuangyin of the Late Zhou Dynasty rose in mutiny, and founded the Song Dynasty (960-1279). In 1206, Genghis Khan unified all the tribes in Mongolia and founded the Mongol Khanate. In 1271, his grandson Kublai Khan, conquered the Central Plain, founded the Yuan Dynasty (1271-1368) and made Dadu (today's Beijing) the capital. During the Song and Yuan Dynasties, handicraft industry and domestic and foreign trade boomed. Many merchants and travelers came from abroad. Marco Polo came from Venice and traveled extensively in China, later describing the country's prosperity in his Travels. The "four great inventions" of the Chinese people in ancient times - paper making, printing, the compass and gunpowder - were further developed in the Song and Yuan dynasties, and introduced to foreign countries during this time, making great contributions to world civilization. In the late Ming Dynasty, the Manchus in northeast China grew in strength. Under the leadership of Nurhachi, the Manchus invaded the Central Plain for three generations in succession, and finally founded the Qing Dynasty (1644-1911). The two most famous emperors of the Qing Dynasty were Emperor Kangxi and Emperor Qianlong. The Kangxi and Qianlong reign periods were known as the "times of prosperity." During Qing rule, some novels of high artist value were created, of which Zau Queqin's Dream of Red Mansions is the best known. It describes the decline of a prosperous feudal aristocratic family.